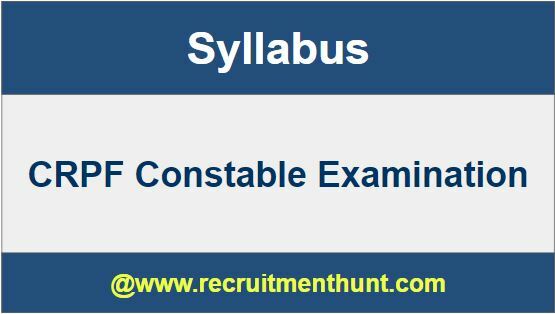 CRPF Constable Examination 2019: The Central Reserve Police Force CRPF Constable Examination Syllabus PDF 2019 is now made available for the interested aspirants here. Hence, all the candidates who have applied for CRPF Constable Recruitment are advised to check the Central Reserve Police Force Exam Syllabus and the CRPF Constable Exam pattern here. Hence, all the applicants can download the CRPF syllabus here and start preparing for the CRPF constable exam 2019. Those candidates who are preparing for the CRPF constable syllabus can check the complete syllabus here in this site and can download the CRPF Syllabus PDF. As the candidates know that the exam syllabus plays a very important role in the preparation of any exam, all the appearing aspirants are asked to check the complete syllabus properly as soon as possible without fail after applying to the CRPF Constable job openings. For helping all the aspirants who had applied for the CRPF constable recruitment, we have given the list of topics which are covered in the CRPF Syllabus itself. So the candidates are advised to divide the CRPF exam syllabus and start their preparation for the constable exams as soon as possible. It is mandatory that all the candidates must know the concepts in detail in which in which they are weak and strong. All the appearing candidates need to concentrate more on their weak areas. Thus the CRPF Constable technical exam Syllabus is very helpful for all the aspirants who want or who are aspiring to score good marks in the CRPF tradesmen constable exams 2019. The Central Reserve Police Force recently has released a notification to fill vacancies for 2945 constable jobs. Hence all the interested candidates who are willing to apply for police jobs and government jobs can follow our site regularly to get the daily job updates of state government and central government jobs. The CRPF Syllabus and the exam pattern are updated below. Hence, all the contenders are advised to check the CRPF exam pattern and the complete syllabus of CRPF from the below sections. The CRPF constable exam basically contains two papers Paper 1 and paper 2. The syllabus covered under each subject is listed below. All the questions in the CRPF Constable examination are objective type and the time duration for the CRPF exam is 2 hours. Each question in the exam carries one mark, and the maximum marks for the CRPF constable exam are 100. Paper 2 contains more weight age than paper 1. Paper 2 contains all the questions from the respective trade. So, all the candidates are advised to prepare well for both the CRPF Papers. Finally, all the CRPF Constable Syllabus provided here are only for the purpose of reference. So, the candidates are asked to check and download the complete CRPF Constable syllabus which is made available here. In the case of any additional information refer to the official website which is given in the above table. So, the candidates are advised to download the CRPF Constable Syllabus and the CRPF Technical Tradesman Constable Syllabus. All the interested candidates are asked to prepare well for the CRPF Examination 2019. All candidates must stay tuned to Recruitment Hunt for more updates.